For the 1st time Outlook Web Access users have the ability to attach and send internal documents with their emails. Simply hit OWA’s Attachments button and users can now fully browse their internal folders, locate files and send as normal. Email used to be more about sending messages now it’s become the primary means for electronic document delivery. Email has gone from being a letter postal service to a package Courier. It’s estimated that nearly 50% of corporate email contains attachments. So that means without full attachment access standard OWA mail is less then 50% useful at best. We believe attachment delivery is the most mission critical function of email. There are lots of alternatives to sending plain messages, phone, SMS but only one established easy way to send files that’s Email. AttachWay empowers Outlook Web Access so your users can carry out their most important and critical tasks. Secure viewing of documents prior to sending is built in. Huge bandwidth saving as files remain inside until exchange sends them, no downloading or uploading required. Group productivity as AttachWay even allows you to save existing attachments to your internal folders. User navigation is simple and much like MS Outlook as users are initially presented with their default home directory and short cuts. Typically they now have access to the same folders as in the office. 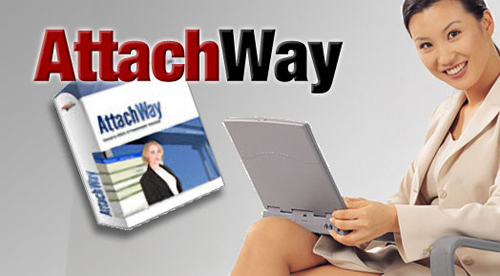 AttachWay even allows users to save their attachments back to internal shares. Example, Imagine you receive an important sales price list attachment, you could now save it to a folder that the entire sales staff could access without ever leaving OWA. AttachWay binds the located files to the body of your composing email as a standard Exchange attachment. Once the send button is pressed your exchange server takes care of the rest and sends the combined message and attachment. The message and attachment are stored in your sent folder. The best part no documents to download and reupload. Built on our intelligent FileWay Management wizard, AttachWay allows messaging management to quickly map users with their shares and internal folders. It maintains a dynamic interface to Active Directory so as users and groups change their shares and file access update automatically, set it up once and forget it. No additional sign-on is required as AttachWay seamlessly integrates to OWA. As you know standard Outlook Web Access limits users to local browsing only for documents to attach. If the files they want are at work what do they do? Use a VPN and download, FTP or some copy important documents to CDs and USB drives and carry them around. In any case they are using the documents on un-trusted computers and leaving copies of the documents behind on workstation and the CDs they carry eventually get lost. At the very least they remain in the browsers cache of the untrusted computer for he next user to find. AttachWay eliminates all of these security holes by allowing users to access their internal shares so no documents are downloaded and left behind. AttachWay even interfaces with our FileWay and SecureView for OWA products allowing Secure document viewing and management. Combined they are a Powerful suite of OWA enhancement products.